Yesterday, her supporters showed up to the polls dressed in white. Today, Hillary Clinton herself made her concession speech dressed in purple — and it all has to do with the historic women's suffrage movement. White and purple (along with green) were official colors for the Suffragettes: according to The Telegraph, Pethick Lawrence, the honorary treasurer of the Women's Social and Political Union established the colors as such back in 1908. In particular, purple held special meaning as "the royal color," standing "for the royal blood that flows in the veins of every suffragette, the instinct of freedom and dignity." Contrasting with white standing for purity and green standing for hope, purple standing for dignity is a concept nicely in line with Clinton's incredibly gracious and inspiring concession speech. Clinton wore an impeccably tailored pantsuit with strikingly purple lapels paired with a purple blouse, and her husband Bill Clinton wore a purple tie to match. Running mate Tim Kaine's wife Anne Holton also wore a long purple vest (though Kaine himself went for some good old fashioned Democratic blue stripes, tie-wise). During and after the speech's live broadcast, a few other members of her campaign could also be spotted in various shades of purple. Much like the impactful and historical reasoning behind the white pantsuit she wore when she accepted the Democratic Party's nomination as presidential candidate, it looks like Clinton chose an equally meaningful color to concede in. Though the attitude of the room could be described as somber, Clinton wrapped up her speech with an inspiring bible verse. She quoted Galatians 6:9, saying, "Let us not grow weary in doing good, for in due season, we shall reap, if we do not lose heart." 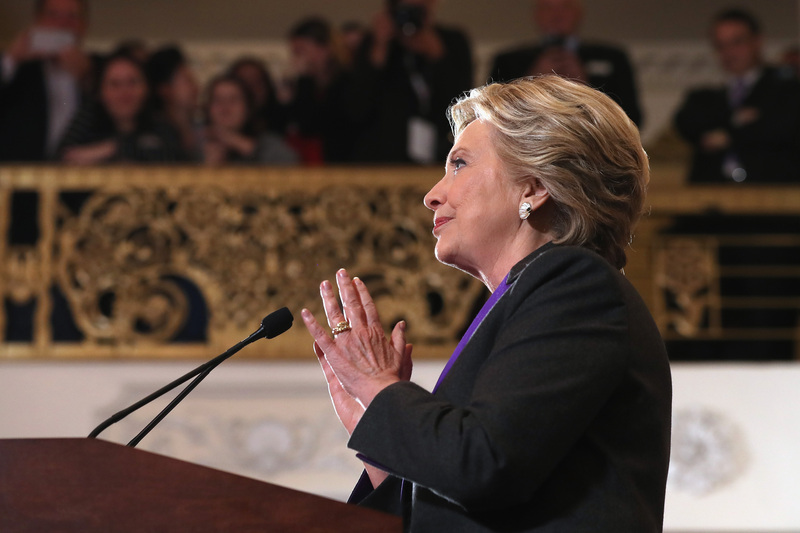 Whether you subscribe to Christianity or not, the message was clear — and it matched perfectly with the symbolic dignity of her purple-accented pantsuit.